Nov 12: According to yet unconfirmed report from Egypt, HK-flagged cargo ship was detained in Dekheila port, Alexandria, Egypt, shortly after arrival on Nov 12. 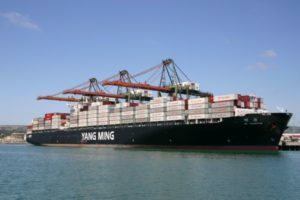 The ship collided with a pier at Container Terminal while mooring, and damaged two cranes, incurring, allegedly, heavy losses. The ship to be under detention until damages cost assessment, and receiving bank guarantee. Port claims the ship was approaching pier at too high speed. Nov 12 Update: It seems like the ship in question is CSCL YELLOW SEA , there’s just no other ship fitting into details, except this one.